It seems like only the other day that the SI T-AMP emerged on to an unsuspecting hi-fi world. Reviewers almost fell over themselves to gush about the sound quality of something called class-T! Other class-T amplifiers followed, some of them reviewed here on TNT, like the DiyParadise Charlize, the Autocostruire 2020, the various 41Hz offerings, and the Trends Audio UD-10 (to name but some). Then Tripath announced that they would be discontinuing the chips, and it seemed as though we had seen the last of class-T amps. But no, they are still being produced in some numbers, and one of the latest incarnations, the Virtue Audio Virtue.ONE, is the subject of this review. Virtue Audio is a new name in hi-fi. I sometimes wonder why people bother to enter such a competitive market. Many of the established names in hi-fi find it hard to survive, so getting going without a reputation is a daunting task. But many of those making hi-fi are enthusiasts, just like you and me. I'm not saying that they don't want to make a success of their venture, and some profit as well, but it kind of explains why they may have chosen to take on what is quite a big business risk. And thankfully for us they do, or we wouldn't have nearly so much choice; compare buying hi-fi to buying a TV for instance. 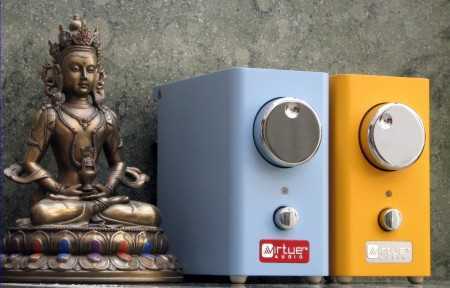 At the time of writing, Virtue Audio are bringing out a range of products, the first of which are the Virtue.ONE and Virtue.TWO amplifiers. I must admit that when I was offered the Virtue.ONE, there was a slight feeling of 'not another T-amp' but then again, having reviewed a few, it is interesting to see if something comes along that is significantly different. When the Virtue.ONE arrived, I was very pleasantly surprised. The Virtue range is available in a range of six finishes. I received a 'ONE' with the 'Clouds' sleeve and a 'TWO' in 'Mesa' yellow. 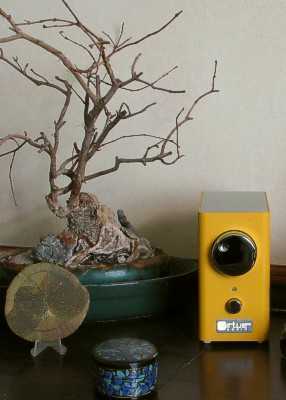 I don't think that I have seen a piece of yellow hi-fi before (that is 'real hi-fi' as opposed to something like an iPod). Although I was expecting something visually a bit out of the ordinary, when I took the Virtue.ONE from its packaging (that included a rather neat draw-string cotton bag), what I held in my hand was quite an eye-opener. Apart from the unusual colour of the aluminium sleeve, the gorgeous chunky shape of the Virtue.ONE, complete with its chrome-plated volume control and push-switch, combined with a not insubstantial weight, make it look, and feel, like a very high-quality item. The sleeve is easily removed by undoing just four screws and un-clipping the lead to the LED. A new sleeve of a different colour can then be fitted, and all in only in a couple of minutes. So if you like your hi-fi to be visually stimulating, or if you want to change the colour when you re-decorate your home, I think that you will be strongly attracted to the Virtue Audio equipment. The dimensions of the amplifier are a compact 5" (125mm) Height x 2 3/4" (72mm) Width x 5.5" (137mm) Depth. Before I go on, let's just go over that last paragraph once more to show you just how much thought has gone into the Virtue.ONE. The chassis is custom built using thick aluminium ( up to 4mm thickness) instead of using an off-the-shelf 'box' or a much cheaper pressed steel, or plastic design. The coloured sleeves are not only coloured differently, but offer a choice of finishes. The coloured ones have a carefully chosen textured finish to further increase that feeling of solidity and quality. The black ones have been sand-blasted to produce a softer, silky feel. The input sockets have a 99% copper centre conductor while the subwoofer output socket that is less critical uses brass. Those speaker connectors are also custom designed and manufactured by Virtue (and yes, they do work perfectly). The knobs could have been made from plastic with a chrome finish like a lot of other modern hi-fi, but Virtue chose to go with chromium-plated steel for the volume knob, and chromium-plated aluminium for the power button. I'm told that these two items alone cost more than the price of the enclosure for the original T-amp. In this 'throw-away' society such attention to longevity and quality is usually only found on very expensive items. That Virtue Audio have paid so much attention to this sort of detail indicates that they expect you to want to keep their products for a long time. I can also report, despite the very small footprint, the Virtue.ONE was remarkably stable on the equipment platform. This despite it having eight speaker cables attached, as well as two heavy interconnects, and the power lead.. 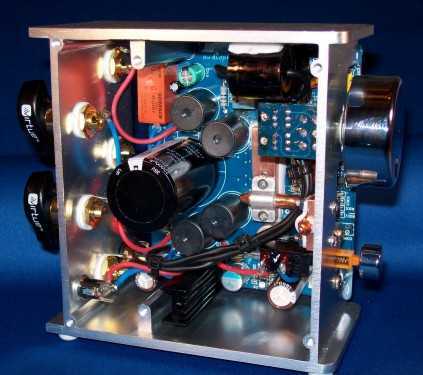 The Virtue.ONE amplifier was engineered by Roger Sheker, of Audience LLC, and is based on the Tripath TC2000/ bridges TP2051 chips and rated at more than 100 wpc into 4ohms/50wpc into 8ohms (depending on power supply used). The upgraded Virtue.TWO is capable of higher voltage and uses the even more powerful Apogee DDX2200 series power chips. Both include a sprinkling of Virtue components. The ONE uses VirtuCap DC blocking capacitors (made by Auricaps) and Cryo-treated Auric hookup wire, also by Audience LLC. The Virtue.TWO version uses full-blown Auricaps, upgrades the brass Propeller Posts with the 99% pure copper binding posts found on the Sensation series, and can handle more power (Virtue will offer an even bigger power supply for it in 2009). Another unusual feature is the use of heat-pipe technology to cool the chip by connecting it to the aluminium chassis. A quick look inside the Virtue.ONE shows a neat and logical layout. This design allows the power chips to stay in the middle of the unit, keeping electrical pathways short, but still effectively using the substantial aluminum chassis as a giant heatsink. While the unit gets warm when played loud over long period of times, the power chips actually stay much cooler than in other designs where small heat sinks are left to get hot quietly inside the enclosure. I am so pleased this lowest cost effort I have ever done has proved to have some real sonic merit. I knew at a gut level that the Tripath design and chip set were far better sonically than any affordable implementation to date had revealed. This is the main reason I decided to enter the fray at such a late date, I wanted an opportunity to provide this superior sound to a large audience. With the basic Virtue.ONE an external switched mode power supply (SMPS) supplies 24 volts to the amplifier section. . Most Virtues will probably choose the relatively inexpensive 30v power supply upgrade for 29 USD (depending on the speakers that they need to drive). These supplies are very low-noise units vetted carefully by Roger Sheker. With the 24 volt supply, the Virtue.ONE can output 30 watts per channel, which makes it much more powerful than the class-T amps running from a 12 volt supply. With the 30v supply, power jumps to almost 50 watts per channel @ 4 ohms (40 WPC @ 8 ohms), twice that (80 wpc @ 8ohms/100 wpc @ 4ohms) when used in monoblock configuration. 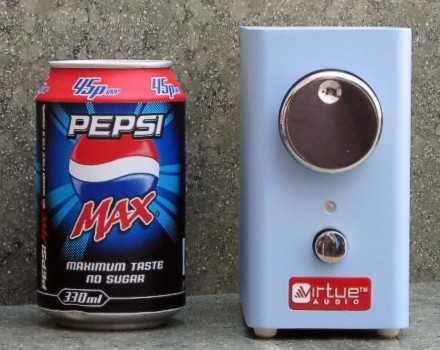 Virtue squeezed a comparatively huge 22,000 uF reservoir cap inside that tiny case to ensure that the Virtue.ONE can play bass without any strain. It's not the only class-T to offer substantially more power. I reviewed the Autocostruire MC4x100, and Lucio took a look at the T-Hi-Fi Power TI amp. But how does the Virtue.ONE stand up when it comes to sound quality? Remember this review is based on the Virtue.ONE using the 30 volt power supply. As soon as I powered up the Virtue.ONE I liked it, and that was with some old test speakers. By the way, there is only the tiniest click a few seconds after the unit is powered down (on less efficient, boxed speakers you may not even hear it). And when it is not playing music, this amplifier is dead quiet. I then tried it with the Music Paradise BS3 bookshelf speakers that I was reviewing at the time. Although the BS3's failed to thrill me, I got my best results from them using the Virtue.ONE. Things were much better on my IPL A2's. The Virtue.ONE is one of those pieces of hi-fi that is fun to listen too. There's no fatigue involved, and I quickly found that I was perhaps paying more attention to the music, and less to the amplifier than I should have been doing (while reviewing it). But when the music demanded it, the Virtue.ONE reminded me it was there. For instance bass was so much better than with a lot of the amplifiers that I have used with those (ported) speakers. The bass is tight and punchy. The mid-range is silky smooth but detailed, and the top end, while not the most extended I have heard was very well behaved, and quite articulate. The Virtue.ONE doesn't seem to favour one type of music over another either, everything that I played was involving and enjoyable. It so happened that I had nearly completed some new open baffles for my old Goodman's 201 drivers. What I hadn't completed was the crossover for the woofers but I decided to connect up the 201's and see how they sounded. The new baffles are narrower than the previous versions, and without the augmenting woofers, I did expect it to sound quite bass-light. So I was very surprised when I started playing 'To All New Arrivals' by Faithless, that it sounded absolutely fine. Yes, I could have done with just a bit more weight at the bottom end, but I could honestly live with the sound even without those woofers. To me, that was an indication of just how much low end grunt the Virtue.ONE has. If you are expecting a slight variation on the 12 volt class-T amps that you have heard, think again, this is clearly a significant step up the hi-fi ladder! Apart from the slight lack of bass (due to the woofers not being used), the sound through the 201 baffles was simply mesmerising, no doubt that the combination worked perfectly together. Fantastic timing, very transparent, a great sound stage with the speakers acoustically transparent. Great detail, and a real sense of the performers being there in front of me. Admittedly, the 201's without a crossover are an easy load for any amplifier but the sound coming out this system was as good as I have heard anywhere. With such promising results, I was keen to use the Virtue.ONE in my main system. But in the past, the phase issue that most class-T amplifiers seem to exhibit (only when used in a multi-amped system) had meant that they did not match well with the class AB amp driving the augmenting woofers in the Hawthorne Audio Duets. So for this audition, I dragged out the Autocostruire MC4X100 class-T amplifier and with the outputs paralleled, used it to power the woofers. And this worked well, the MC4x100 was clearly up to the duties handed to it below 60 hz. The main system consisted of a modified SB3, modified DacKit DAC, Pedja Rogic Jfet buffer, the Virtue.ONE and Hawthorne Duet speakers, with the MC4X100 amplifier fed from an active crossover and powering the bass woofer section of the speakers. I usually bi-amp the mid-range and tweeters on this set up, and decided to go with bi-wiring for this review. Despite the smallish size of the Virtue.ONE, it was quite easy to connect all the speaker cables to it. I used spades and banana plugs, and due to the way the binding posts have been placed, it was an easy job. It's the little things like that, that make this amplifier so satisfying to use. Compared to the four-channel regulated Gainclones the Virtue.ONE sounded very slightly clearer, and more neutral than the warmer sounding Gainclones. The sound was a little more up front, and punchy. Live music in particular benefited from this presentation. Sound stage was wide and deep and imaging produced slightly larger images of instruments and performers than most amplifiers that I have heard in that system. There is plenty of 'space' between everything, and even when the music gets complex, everything stays in its place. It also conveys the most emotion that I have heard from any of the class-T or class-D amps. There is a good sense of realism, particularly with individual instruments. Stringed instruments like cellos and violins were almost life-like. Drums when played loud were also very realistic. And it sounded good whether listening casually at lower volume levels, or turning up the power when the neighbours were out. The timing was fantastic making foot-tapping almost compulsory. I could go on and on but suffice to say that the Virtue.ONE ticks all the boxes. After seven previous class-T amps, this is the first that I didn't want to take out of the system! It is also the only one that really conveys emotion in spades. I also noticed something else about this amplifier. It helps make sense of some types of music like jazz and classical music. What I mean is that if you listen to that sort of music but can't get 'in' to it, then the Virtue.ONE may help you. I found myself somehow 'understanding' passages of classical music in a way I haven't in the past. And the same with some of the more complex jazz recordings by artists like Pat Metheny. I'm not sure why this should be, and it opens up a whole new topic that would be too long to go into in this review. Initially I was unable to choose between them and the GC's, with them sounding different, rather than better or worse, but after a week I was addicted to the Virtue.ONE. And to its credit, the Virtue.ONE was playing 'through' its volume control, and with only two channels instead of the four that my Gainclone has. The GC's sound more 'traditional I guess, while the Virtue.ONE is more exciting and less restrained. The Virtue.ONE is clearly more fun! I can't really find a weakness with the Virtue.ONE. I originally thought that the top end was not quite a sparkly as the Gainclones, but after a week of playing that issue is resolved, possibly due to the burning in of the VirtuCaps. I'm not going to get as carried away as some of those reviewers of the SI T-Amp but the Virtue.ONE really is a star in its price-range. This amplifier in basic form costs 249 USD and shouldn't be compared with amplifiers costing ten times as much, but it will embarrass many that do cost quite a bit more. Given its looks, and the build quality, the Virtue.ONE is great value for money. I think the looks will sell quite a few Virtue.ONE's, and remember that you can choose from five vivid colour schemes. This amplifier is fun to listen to, and fun to look at. It will also fit nicely onto a desk. It's almost cheap enough to use as part of a computer desktop system but I see it much more as a 'serious' amplifier for a decent hi-fi system. I can see the Virtue.ONE as a great partner for something like a Logitech SB3 (Classic) streaming audio server, and a pair of small but high-quality speakers, ideal for those with cramped living space but who refuse to compromise on sound quality. Virtue has catered for just that scenario by providing a buffered output on the Virtue.ONE so that smaller speakers can be augmented by a sub-woofer. It would be totally misleading to describe the Virtue.ONE as another class-T amp with more power. I won't name names, but listening to one of the better lower powered class-T amps against the Virtue.ONE clearly reveals the superiority of the Virtue amplifier. In comparison the smaller class-T sounded a bit soft, a bit less focussed, less punchy. It sounded 'nice' to listen to but not as good. And turn up the power, even on my more efficient speakers, and the bass really starts to be a problem. The Virtue.ONE has no such problem. Despite it's diminutive size, it can rock with the best of them, and coupled with a good speaker will provide true Virtue quality rather than being confined to duties on a computer desk. There aren't that many of these higher-power class-T amps around. The T-Hi-Fi Power TI amp is another one reviewed at TNT but that has three inputs compared to the single input of the Virtue.ONE, has similar power, and costs significantly more. If you need more inputs, the Virtue Audio Sensation M541 offers three inputs, a little more power, and is priced very close to the T-Hi-Fi Power TI. (A review of the Sensation amplifier is due soon) When describing their amplifiers, Virtue prefer to compare them with those made produced by the likes of Red Wine Audio and Bel Canto ( Evo amplifiers) that have realised the real potential of the Tripath chipsets. They are also happy to have the Virtue.ONE/TWO compared to full sized amplifiers, ie without consideration for the small physical size. It would be very interesting to compare the Virtue amplifiers against the Red Wine and Evo counterparts. I believe that the Virtue.ONE redresses those short-comings, ie it does sound crisp and has vitality. And it certainly has P.R.a.T. And I find it slightly less forgiving of bad recordings than my GC's. But this review is about the Virtue.ONE and I will sum it up by saying that in every way, this little amplifier has thoroughly impressed me. And to be honest, it would have still impressed me if it cost twice as much! It's a lot of responsibility to tell anybody to spend their money on something, but in this case I am happy to say get one before somebody tells Virtue Audio to increase the price! I have a feeling there may be some questions arising from this review so I will try and save us some keyboard time by addressing a few points here. I have heard both the Virtue.ONE and the Virtue.TWO. So how do they sound compared to one another? Well on the same, ie 30 volt, power supply, I am not sure if I could tell any difference in a blind listening test. So what is the point of the Virtue.TWO? you ask. Well the TWO does have a few extra Virtue parts. For instance the input caps are Auricaps instead of the Virtucaps. The speaker binding posts, (still the Propeller design) have a copper post instead of brass. Does the Virtue.ONE on the standard 24 volt supply sound different to one used with the 30 volt supply? Again the difference was small with my efficient speakers. Trying it with the IPL A2's (89db) I felt there wasn't such great control of the bass with the 24v supply. I always tended back toward the 30 volt supply, and at the price, I would personally recommend that option with the Virtue.ONE. It makes a very good amplifier into a great one in my opinion.